The 35-year-old will captain England in Wednesday's friendly against Ecuador as the build-up to the tournament in Brazil continues. 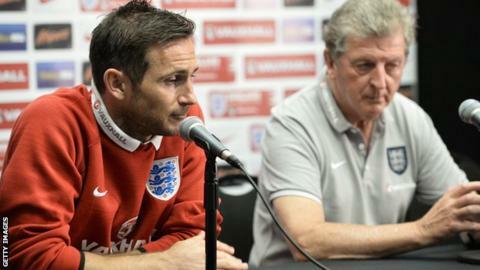 When asked if the World Cup would be his swansong, Lampard told BBC Radio 5 live: "It looks that way. "I find it hard to get the words out to say that it is, because I'm very proud to play for my country." Lampard, who has 103 international caps and has also announced his departure from club side Chelsea, added: "Who knows what will happen? Let's hope we have a successful World Cup and then I'll comment on that after." "I wouldn't say it felt in doubt but I'm very aware," he said. "When I was 26 or so and scoring all the qualifying goals, I probably felt more comfortable. "I was desperate to get into the squad but I just tried to keep a lid on it. "I was very proud. It was a big feeling for me because my appreciation of being involved in tournaments like this has grown. "I know it won't go on forever, so I'm enjoying every minute." Meanwhile, Hodgson said he was striving to keep England's preparations simple. "I have two further preparation games and we will really start thinking about the team for Italy when we start our journey to Brazil," he said. "We are trying to continue the tactical and technical work we have been doing. "At the moment, I take it one step at a time. "If we play well, if our players play to their best and if we get the rub of the green, we believe we can have a very good World Cup." Go to our new World Cup features and video index for in-depth content and analysis. World Cup squads: Who is going to Brazil? Read more on World Cup 2014: Which players are going to Brazil?